I don’t how feasible this is but I’d really like to be able to define a Write action that uses Transmit (5) to upload (to a specified location) at the end of a workflow. It looks like this would be scriptable, or something like rsync would work, but a built-in action would be super. You can use the Transmit Disk feature (of Transmit, obviously) to mount a remote server as a local folder in macOS. A simple write action will then upload automatically. Hi @gingerbeardman. Thanks for the suggestion, but alas the particular protocol I want to use (Dropbox) isn’t supported by Transmit Disk. Then why not write to your local Dropbox folder? Another option is to use the Save As Droplet feature in Transmit. 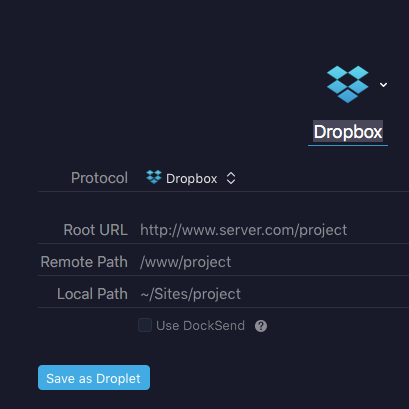 This creates a small app that will accept files and upload to that server, using Transmit behind the scenes. So then you can just use Retrobatch’s Open In App. I just tested this method with my Dropbox and it worked a treat! That Droplet plus Open in App looks like it will do the job. Will test presently. Thanks for your advice! It might be possible to make this happen a little faster with the AppleScript node. I’ll look into that in a bit. I added a new AppleScript property to assets to get the file path. Sorry for the slow reply. I only just had time to come back to this. Works perfectly. Just configure the Favourite in Transmit and Go! Thanks. Really super. Keep up the good work! This script isn’t working for me, at least not as I thought it would. The files uploaded are the original files defined in the “Read images” node. I thought this script, linked from the “Write images” node, would upload the processed files. Is it possible to get the processed file path? If the file was written to disk, then the AppleScript interface will return the last written location for the path. That’s perfect now. Thanks !! Edit: I spoke too soon. This may not be related but, when I save my workflow as a droplet and run it I get an AppleScript Error “Can’t get document BaseWorkflow”. And indeed, the RB document itself has now changed name to BaseWorkflow.retrobatch.